A motion being debated this evening and tomorrow would see the State back out of repaying bonds and promissory notes. People Before Profit TD Joan Collins will this evening argue the case for burning all remaining bondholders in Anglo Irish Bank. THE UNITED LEFT ALLIANCE is to force a Dáil vote tomorrow evening on whether the State should repay the unsecured bondholders of Anglo Irish Bank. A motion has been tabled by the five-member group, backed by the other 11 members of the independent technical group, which would force the government not to repay obligations worth up to €50 billion. The motion includes an instruction not to repay the €1.25 billion unsecured bond issued by Anglo which matures tomorrow, or any further payments to bondholders in Anglo, now the Irish Bank Resolution Corporation. It also orders the government not to pay up for any of the promissory notes issued by the State to Anglo, which are due to begin maturing in March of this year. Those promissory notes – a form of IOU issued by the government to Anglo so that it could meet its immediate obligations in the last few years – are set to cost the government over €3 billion, plus interest, each year for at least 15 years. 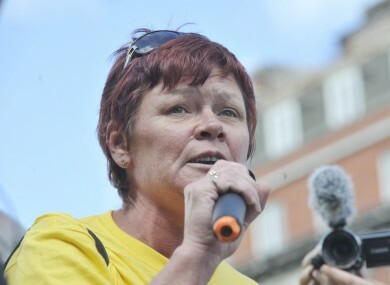 People Before Profit TD for Dublin South Central, Joan Collins, said she did not expect the motion to be carried – anticipating that it would be “trampled down” by the government’s majority – but that it had been tabled to raise the issue in the Dáil. “The people who bought these bonds bought them at a 50-to-80 per cent discount, and they’re being repaid in full. It’s an absolute outrage that they’re getting the full payment,” she told TheJournal.ie. That’s money that could be used for overturning the cuts in health, education and other areas… we cannot understand why this is happening, when at the same time the government are introducing huge austerity. The government is likely to table an amendment to the motion, in order to water down its criticism of the government, in order to avoid a straightforward vote on whether to honour the outstanding Anglo bonds. Debate on the motion is to begin this evening at 7:30pm, with 90 minutes of debates this evening and a further 90 minutes’ tomorrow. — shall not pay the promissory notes for the Anglo Irish Bank/INBS debt on 31st March, 2012 and shall not make any such payments in the future. Signed by: Joan Collins, Richard Boyd Barrett, Clare Daly, Seamus Healy, Joe Higgins, Stephen S. Donnelly, Luke ‘Ming’ Flanagan, Tom Fleming, John Halligan, Finian McGrath, Mattie McGrath, Catherine Murphy, Maureen O’Sullivan, Thomas Pringle, Shane Ross, Mick Wallace. Poll: Should we repay the Anglo bondholders? Email “ULA to force Dáil vote on burning Anglo bondholders”. Feedback on “ULA to force Dáil vote on burning Anglo bondholders”.